How Many Jelly Beans? is the Sneaky Chef of picture books, but instead of hiding vegetables in kid friendly foods, Andrea Menotti and illustrator Yancey Labat (illustrator of the superb Worst Case Scenario Ultimate Adventure Series of choose-your-own adventure books by David Borgenicht) have hidden math facts inside of a brilliantly colored, candy coated story about two siblings trying to out do each other. This husband and wife duo have created the candy version of a picture book with their oversized, brightly colored book that also has a giant fold-out poster at the end that has one million jelly beans on it. Amazing! Menotti's story is a simple one. Siblings Emma and Aiden are offered jelly beans. "How many jelly beans would you like, Emma?" is the gun that goes off at the start of the race. 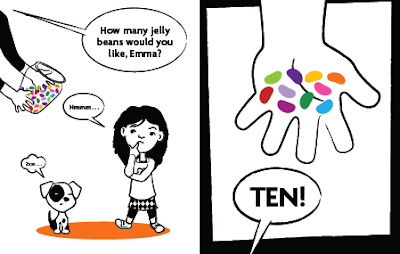 Emma asks for ten jelly beans. Aiden asks for twenty. Murphy the dog takes a quiet interest in the battle as it escalates. Very quickly the siblings are looking at 500 jelly beans, Emma insisting that Aiden cannot eat that many. When Aidan insists he can eat 1,000 jelly beans in a year Labat presents a wonderful spread with calendar pages for each month of the year, each day having two or three jelly beans in its box. Another fantastic illustration is Emma on her bed with 5,000 jelly beans covering her bedspread. 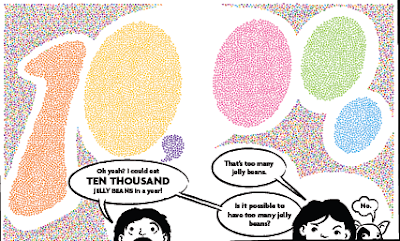 One of the delightfully sneaky things that Menotti and Labat do in How Many Jelly Beans? that makes this book so enjoyable is to present the rising quantities of jelly beans in interesting settings. 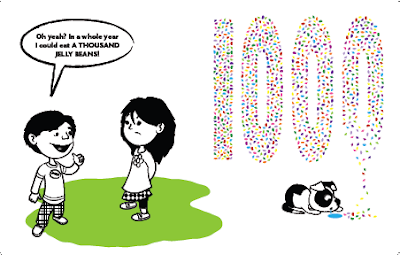 They even manage to make 10,000 and then 100,000 jelly beans spread across a page interesting, especially when Aiden says, "If I had a hundred thousand jelly beans I'd choose . . . 5,000 blueberry, 10,000 watermellon, 2,000 cherry, 25,000 orange, 50,000 grape, 4,999 strawberry and 1 lemon." The final fold-out page of How Many Jelly Beans? finds the siblings thinking that 1,000,000 jelly beans are "probably too many." To that, Murphy responds, "Speak for yourself." 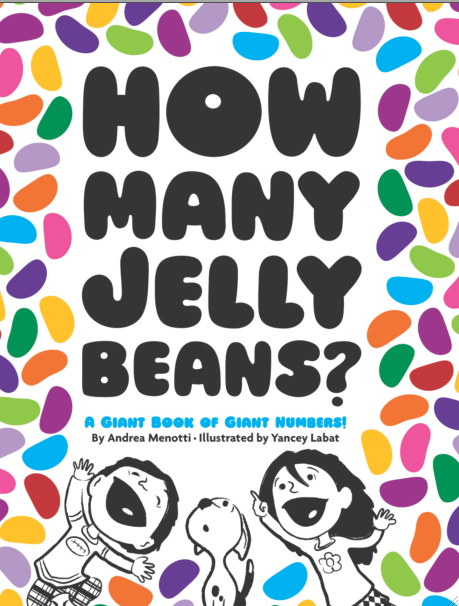 One thing I'm sure of, there can never be enough books like How Many Jelly Beans? How Many Jelly Beans? is also reviewed at fuse #8 and 100 Scope Notes. Awesome! Have you seen the book "How Much is a Million?" 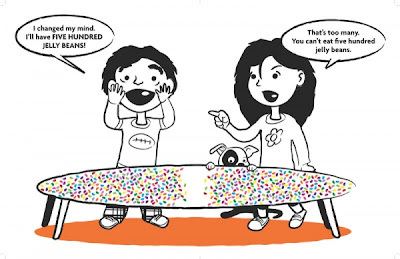 It does a nice job of trying to explain large quantities to kids. "How Many Jelly Beans?" looks like a great addition to our collection of math books. I love that you have a math tag on this - I'll have to look at what other math related books you've reviewed. Aaron is very interest in numbers. We have a few of Greg Tang's books, too, which are fun. Math-terpieces is my favorite so far. Yes! I do know "How Much Is a Million." It's such a great book and I kind wondered why we needed another one, but "Jelly Beans" is so visually appealing there is definitely room on the shelf for it. Greg Tang's books are great, too. I'm thinking maybe I need to do a round up of math picture books. Another good one just turned up on my cart at the bookstore the other day.